A set of luxurious made to measure striped roller blinds can make all the difference to the unity of a room’s theme. With our wide variety of options, ranging from bold, vibrant and striking patterns to muted, neutral designs in both vintage and contemporary styles, you can be sure that you’ll find the perfect set to complement your homes interior. Stripes are a versatile way of introducing a pop of colour and a great approach to bringing some order to your space. 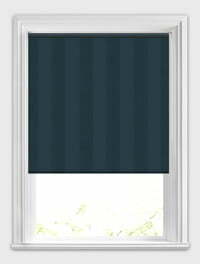 Choose from contemporary broad horizontal stripes through to classic vertical pinstripes in hues of red, blue, green, yellow, grey, black and white. This stylish collection of stripy designs has something to suit all tastes. They are a fabulous way to introduce some beautiful colour and timeless design to the windows and really add the wow factor to a rooms décor. Whether it’s the kitchen, bedroom, dining room or living room you are looking to adorn with a stripy look, our stylish collection of fabrics is sure to help you create the look you are trying to achieve. Excellent service - samples sent to us and once blind ordered it arrived quickly. Easy to assemble and put up and very happy with quality. Having received my blinds I was really impressed with the quality, came in the time that was advertised and with the promo code was a fantastic buy. Thank you. Very good quick easy to understand service. We are extremely pleased with our two new roller blinds for our kitchen. They arrived on time and undamaged. They were easy to fit. We would certainly use this firm again and recommend them to our friends. Very satisfied with process of ordering blinds, delivery and quality of product.